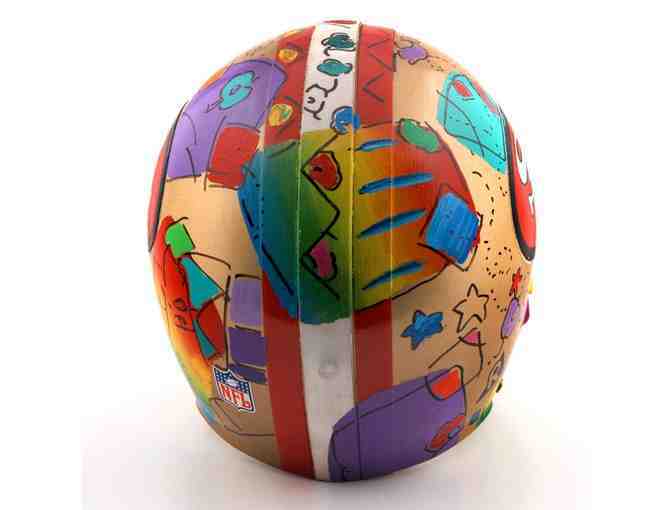 1994 Very Rare Peter Max Original Painting on Pro Line NFL Licensed San Francisco 49ers Pro Football Helmet! Includes Certificate of Authenticity! 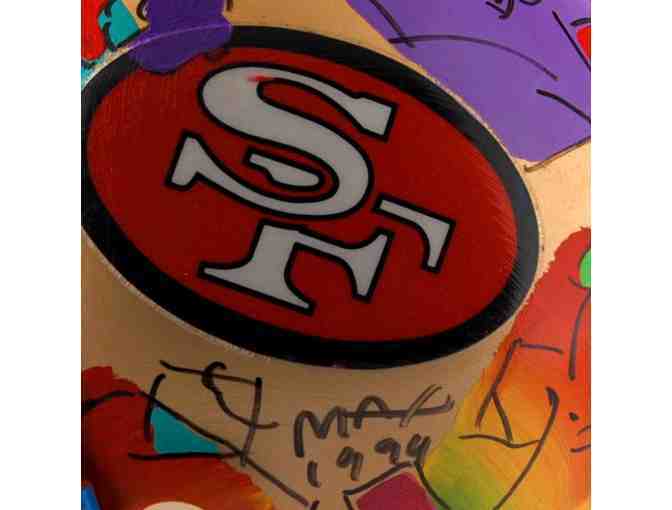 This very rare Peter Max original painting is a piece of history celebrating the San Francisco 49ers! 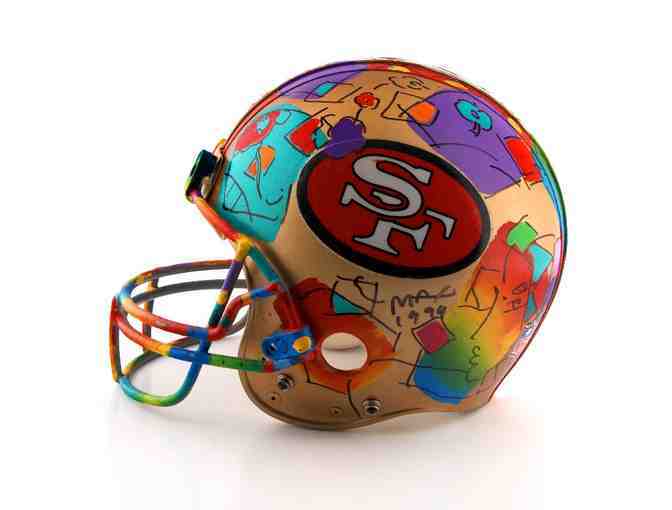 This Riddell Pro Line National Football League licensed San Francisco 49ers Pro Helmet was hand-painted and signed by Pop Art Master Peter Max in 1994! Peter Max is famous for making very special awesome objects even more amazing by adorning them with his incredible iconic art genius. From giant cruise ships and planes to race cars and football helmets, the art of Peter Max will always astonish and delight! 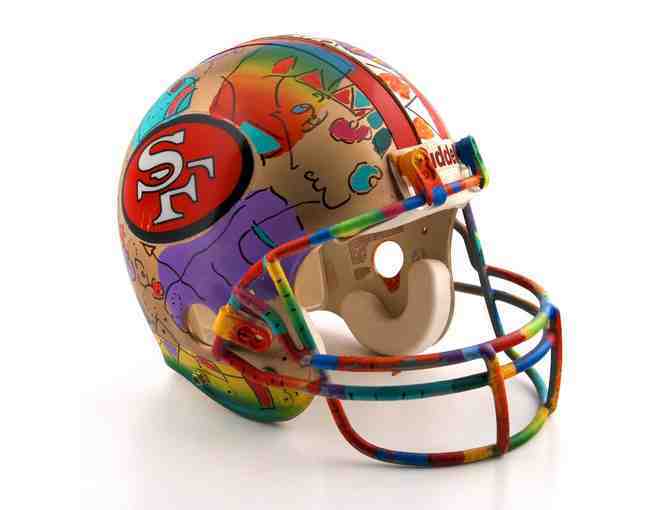 Standard full size San Francisco 49ers' football helmet measures approx. 10" x 11" x 13" (width x height x depth). Includes Certificate of Authenticity! ABOUT THE ARTIST: "The most popular Artist in the World today"
Born in Berlin, Germany in 1937, Peter Max was raised in Shanghai, China, where he spent the first ten years of his life. He lived in a pagoda-style house situated near a Buddhist monastery, a Sikh temple, and a Viennese cafe. With all that richness and diversity of culture, he still had a dream of an adventure yet to come in a far-off land called America. From American comic books, radio broadcasts, and cinema shows, young Peter formed an impression of the land of Captain Marvel, Flash Gordon, swing jazz, swashbucklers, freedom, and creativity. In 1953, Peter's family emigrated to America after a six-month visit to Paris. During this relatively short stay, Peter enrolled in an art school and began to absorb the culture and artistic heritage of Paris. At the age of sixteen, he realized his childhood fantasy and arrived in America. After completing high school, Max continued his art studies at The Art Student's League, a renowned traditional academy across from Carnegie Hall in Manhattan. Here, he learned the rigid disciplines of realism and developed into a Realist painter. As a portraitist for four former U.S. Presidents (Carter, Ford, Bush, Sr., and Reagan), Max was approached by the inaugural committee in 1993 to create posters for Bill Clinton's inauguration. He was later invited to the White House to paint the signing of the Peace Accord. The San Francisco 49ers are known for their prowess and powers on the football field, as evidenced by their victory in five Super Bowl Championships in less than fifteen years ¿ they won a third of the championships in the eighties and early nineties!